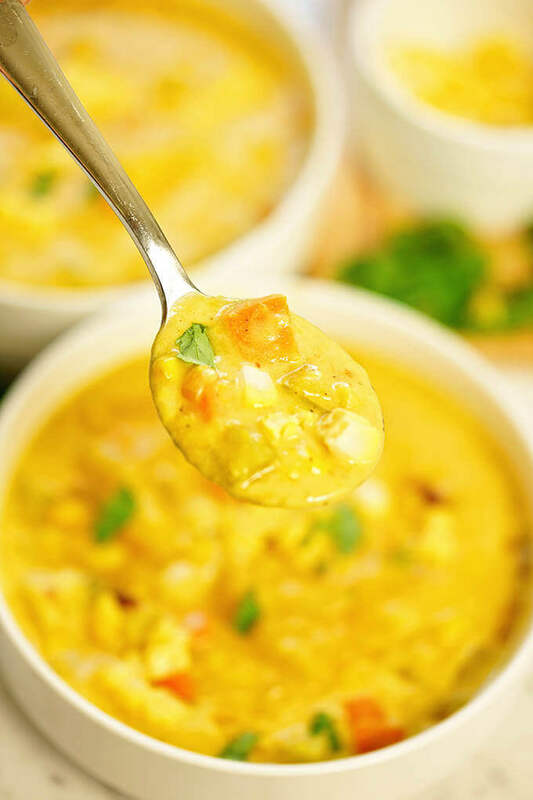 Vegetarian Corn Chowder that is spicy, creamy, rich and hearty! 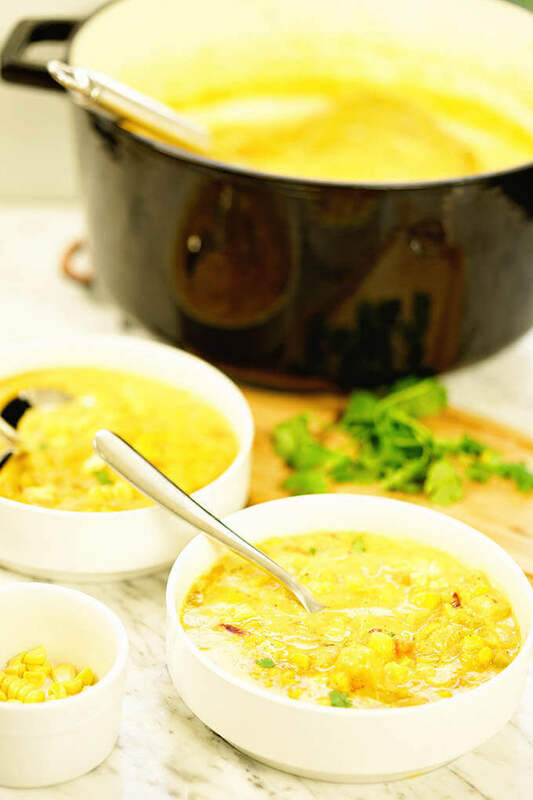 Fresh crunchy corn on the cob, spicy chipotle peppers and creamy potatoes make a simple but flavorful vegetarian corn chowder that is full of big flavor! This is a quick and easy dinner! This easy chowder is on the table for a quick weeknight meal and is so delicious! It’s a tragic thing, I’ve developed a severe allergy to corn, well not the corn itself but the husk. Anyone else have that issue? Now don’t get me wrong, it really hasn’t changed much except that I bring piles of corn home and my wonderful husband is nice to husk it for me. As long as I don’t touch the husk I’m fine. 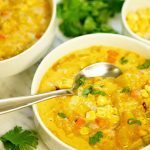 But it really hasn’t stopped me because there are so many delicious meals to be made with corn like Turkey Corn Chowder, Instant Pot Corn on the Cob and Black Bean Corn Avocado Salad! I know you understand! You’re going to love this chowder! It’s full of vegetables, it’s bright, crunchy and filling and one of our favorite summertime soups! Our local corn grown thru the AG department at Fresno State is world renowned for the best corn, but you know this because I’ve bragged about it before! But don’t be sad, if you’re not nearby, stop by a local farmers market or stand. Sweet corn is readily available now that the end of summer is near and I know there’s some great corn with your name on it! 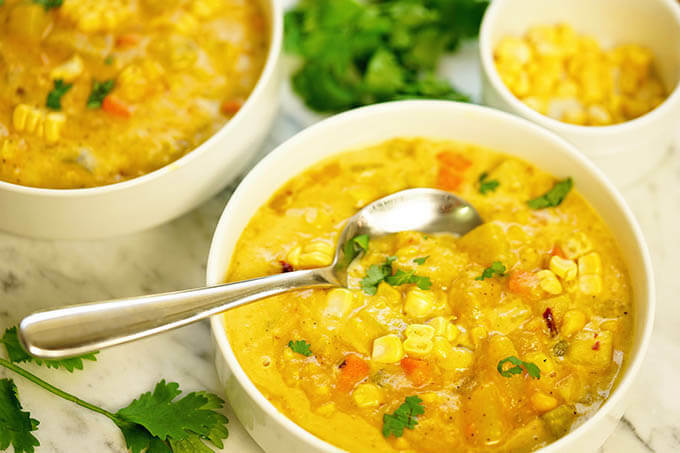 Spicy chipotle chili gives this hearty vegetarian corn chowder a delicious warmth! There’s lots of spices in this soup and you’re going to love the combination of flavors. It’s easy and flavorful. 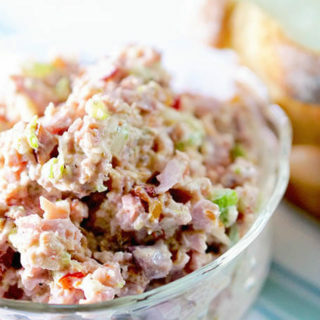 Super savory and easy to make. The hardest part? Eating only one bowl! It’s kind of like that old chip commercial daring you to eat just one! What makes it a chowder? This Vegetarian Corn Chowder is thick and hearty. Chowders are rich and creamy and often contain potatoes and onions. For more delicious bites about Homemade Soup – click here for my Complete Soup Guide. Many chowders are thickened by flour, cornstarch or other thickeners. This chowder is thickened by simply blending a portion of the soup. 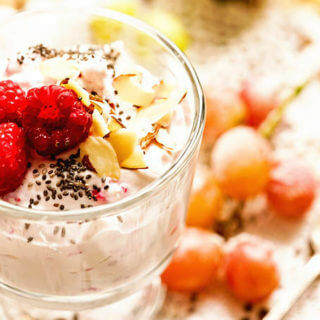 A spot of heavy creamy takes this right over the top making it creamy and delicious! What gives this chowder it’s spicy warmth? Chipotle pepper. Don’t worry, it’s just one. It adds warmth and body to the chowder without adding overbearing heat. It’s absolutely delicious, hearty and an AMAZING chowder!! Shuck corn and remove the silk.Carefully cut the kernels off the cob. Take about 1/2 cup of the kernels and set them aside. Peel and dice the onion, carrot and potatoes. Heat a stock pot over medium heat, add the olive oil and onions, corn, celery and potatoes. Season with all of the spices. Sauté for 5 minutes until the onions just begin to soften, stirring occasionally. Add the vegetable stock. Increase the heat to high and bring to a boil. Boil about 10 minutes or until the potatoes are very tender. When the potatoes are tender, remove a couple cups of the soup and blender until creamy. Add the cream and stir. Garnish with reserved corn and cilantro. My friend Nicole sent me a picture of a meal she enjoyed at a local restaurant. A beautiful bowl of corn chowder finished off with a drizzle of truffle oil. I have to say, that had me drooling! 😀 Next time I make it, I will add a drizzle of truffle oil too! So how about it, have I talked you into trying this soup? Need a new soup ladle? This one is on my wish list because it’s just so fun! Made with local fresh ingredients and bursting with the flavors of summer, Vegetarian Corn Chowder takes just over 30 minutes to make. It's rich, hearty and creamy bowl of chowder. Shuck the corn and remove silk. Carefully slice the kernels off the cob. Reserving about 1/2 cup of the kernels and set them aside. Peel and dice the onion, carrot and potatoes. Be sure to cut the potatoes in a small dice, about 1/2" x 1/2". Mince the chipotle pepper. Heat a stock pot over medium heat, add the olive oil and onions, corn, celery and potatoes. Season with all of the spices; salt, pepper, red pepper flakes, curry powder, coriander, turmeric and chipotle. Sauté for 5 minutes until the onions just begin to soften, stirring occasionally. 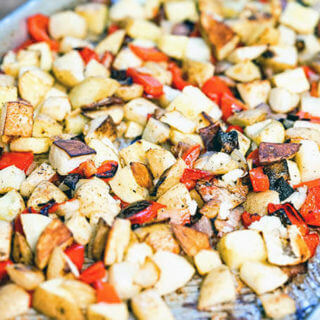 When the potatoes are tender, remove about 1/3 of the soup and add to a blender. Blend until creamy and pour back into the stock pot. Add the cream and stir together well. Garnish with reserved corn and minced cilantro. I lived in NJ and spent summers in Maine. It was always hard not being about to sample their “corn chowdah”, so, I would make my own. 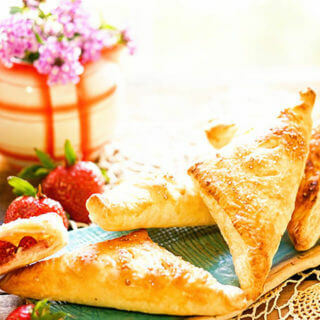 Your recipe is very creative and you have made it look very easy to make. I got a giggle when I “heard” you pronounce Chowdah, just made me smile! 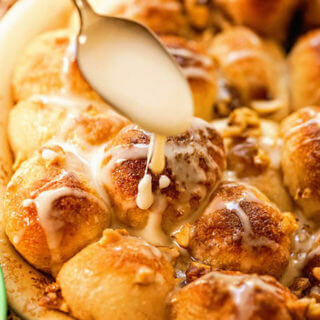 Thanks for the compliment on the recipe, I hope you give it a try! This looks like a delicious summer meal, awesome! Last year I made a summer vegetable chowder and I loved it. I know I would like just the corn chowder as you have made. It sounds and looks ever so delicious. I love soups in the summer – all year long. We are getting Georgia corn here and my husband planted corn so we have our fingers crossed for a lot of it. Soups on the list if we do. I bet your homegrown corn will just be delicious Patty, enjoy!!! I love the sound of this chowder. 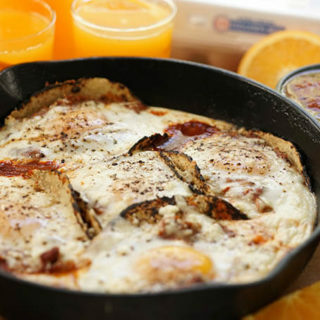 Its easy, hearty and certainly delicious!! Looking forward to trying this recipe. Please let me know what you think Angela, we just love this soup! I love a good corn chowder. Potatoes are the best way to thicken a soup. I have seen lots of chefs on TV use that instead of cream to keep it lighter but give you that chowder feel. I agree Peter – I like make creamless “creamy” soup using Yukon gold potatoes, I think they really give a nice creamy texture! I can’t wait for our corn from our garden to be ready so I can try this! So yummy, I hope you do give it a try Gaye! I love corn chowder. I never have ever thought to add curry to mine, or coriander for that matter. Sounds like a great switch up from a typical chowder. I have to mention too, when I was pregnant, I made a big huge pot of corn chowder and as I went to move it to the table, I dropped the entire pot of it on my floor. I sat and cried (obviously from all those hormones). Anyway, seeing your chowder just brought me a laugh thinking back to that! Eeek! I bet it brought you a laugh and nightmares you poor thing! I’ve dumped stuff before and what a pain to clean it up. Thanks for sharing a memory! Today is a little cooler and a comforting bowl of corn chowder is just what I need! I love how you give tips to thicken this soup too, it is really helpful!